Dr. Leow to talk about "Innovation Inspiration"
Dr. Alex Leow will be at participating in the Digital Health Coalition MIdwest Summit at Takeda. This networking event features industry leaders and experts from Takeda, Abbvie, Google and Astellas. We thank Dean Pete Nelson for allowing us to present DiaBetty to the distinguished Advisory Board. It was a great opportunity to showcase our developing technology to assist patients with diabetes self-management using our voice-first, mood-sensitive platform. Photo Credit: Dr. Alex Leow! The CoNECt lab will present data at MICCAI on using PhASE: Phase Angle Spatial Embbeding as a novel method to understand the topology of functional connectomes. Dr. Leow will be presenting our work with BiAffect as part of a panel and networking event on applied AI in healthcare. See the link for more details. Dr. Alex Leow and Faraz Hussain were invited to participate in a select group of mHealth researchers developing the standard frameworks for ResearchKit (iOS) and ResearchStack (Android). Dr. Ajilore will be part of the panel "The Future of Diabetes Education - "Live" Educator and "Virtual" Coach Partners in Care" at this year's American Diabetes Association meeting in Orlando, Florida. He will be presenting DiaBetty, an Alexa-enabled virtual diabetes coach that is sensitive to the user's mood state. Dr. Leow will presenting our latest method for analyzing the intrinsic topology of functional connectomes, PhASE. For more info, see here. Bonjour! CoNECt lab collaborators Ouri Wolfson and Carlo Vittorio Cannistraci will be presenting joint work from the lab on Massive Hierarchical Parcellations and Latent Geometry Network Markers Neuroscience and Precision Medicine at this year's Network Neuroscience satellite meeting in Paris, France. BiAffect was chosen by NIH to be presented at the 2018 mHealth Technology Showcase on June 4, 2018. We're excited to demonstrate BiAffect as an open science research tool to improve the reliability and validity of passive sensing using keyboard metadata. We are looking for post-doctoral fellows interested in computational psychiatry, connectomics, machine learning, neuroimaging. This 1-2 year fellowship is funded by the Department of Psychiatry at the University of Illinois at Chicago. Click on "Contact Us" if you are interested! Dr. Ajilore will be presenting work from the CoNECt on two panels covering topics ranging from the role of neuroinflammation in aging and depression to digital interventions for integrated mental and physical health. CoNECt Lab's BiAffect to be featured at SXSW 2018! BiAffect will be featured during the HealthSpark Barracuda Bowl at SXSW 2018. This Health Tech event presents the latest innovations tackling health care's biggest problems. CoNECt team member Faraz Hussain will be doing the pitch at the Barracuda Bowl and Dr. Alex Leow will be panelist discussing the interface of academia and industry. Dr. Leow IGNITES Innovation at UIC! Drs. Ajilore and Leow presented the latest work from the CoNECt lab at the 8th Annual Departmental Research forum, headlined by NIMH Director, Dr. Josh Gordon. 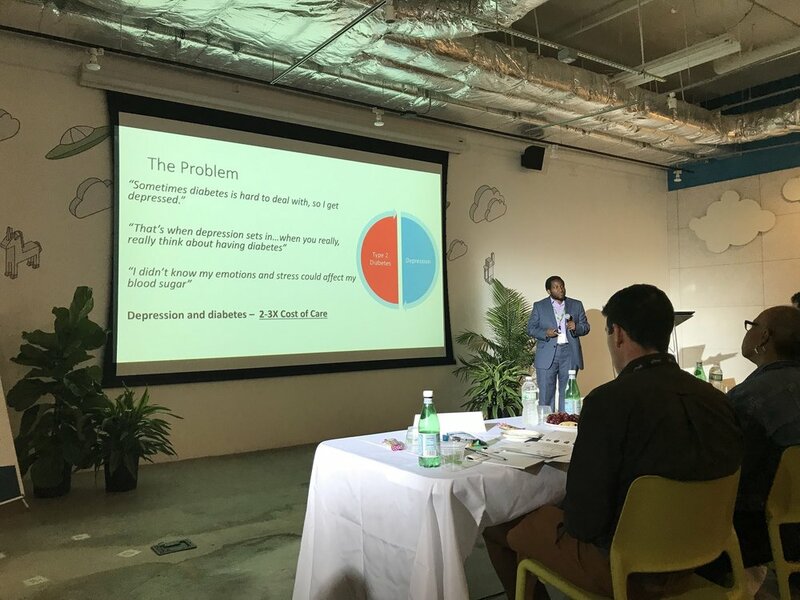 CoNECt lab members Olu Ajilore, Faraz Hussain, and Alex Leow along with collaborator Dr. Melvin McInnis were in attendance at the Alexa Diabetes Challenge Demo Day held at the Amazon AWS Pop-up Loft in Soho, NYC. 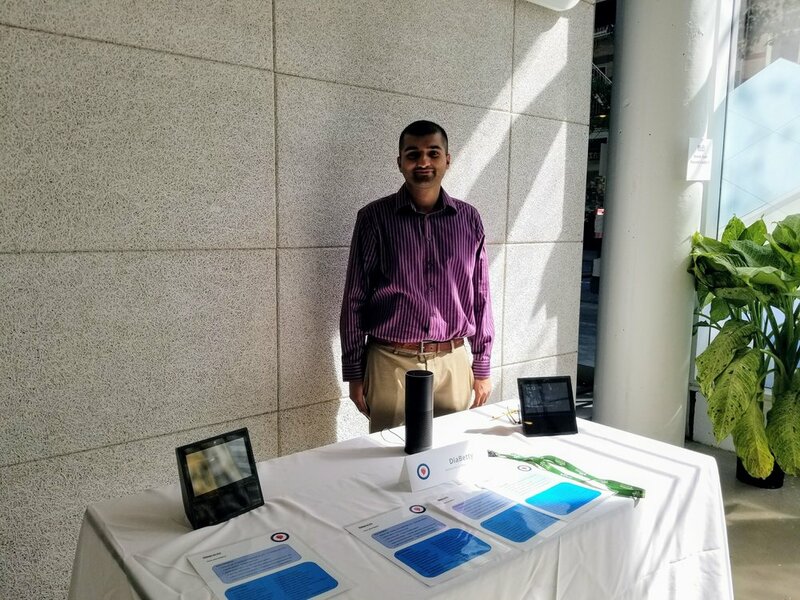 It was a fun day of demonstrations and presentations in front of 250 audience members including press and executives from Amazon and Merck and Co. Luminary Labs did an incredible job running a well-produced challenge. The DiaBetty team is proud to be one of the finalists and we're eagerly awaiting annoucement of the winner! DiaBetty @ The Alexa Diabetes Challenge Demo Day!! Members of the CoNECt lab will be in NYC presenting DiaBetty at the Alexa Diabetes Challenge Demo at the Amazon Web Services Pop-Up loft. We're excited about our voice-enabled solution for helping patients manage diabetes in a mood-sensitive manner. Team members (from left to right): Alex Leow, Faraz Hussain, Olu Ajilore, Ben Gerber, Jun Ma. Melvin McInnis (not pictured). DiaBetty to attend the Alexa Diabetes Challenge Boot Camp in Seattle! The DiaBetty team will be attending the Alexa Diabetes Challenge Boot Camp in Seattle, WA sponsored by Merck & Co. and Amazon Web Services. The team will learn about living with type 2 diabetes and how voice technology can help those dealing with the disease. We're excited to take part in this exciting opportunity with the other four finalists of the challenge. DiaBetty chosen as finalist for the Alexa Diabetes Challenge! DiaBetty has been selected as one of the five finalists for the Alexa Diabetes Challenge and is the winner of a $25,000 prize. Read more about DiaBetty here. The CoNECt lab presented work from the PACE project (recently published here) and a preliminary connectometry RDoC project (in collaboration with Dr. Luan Phan) at the annual meeting of the Organization for Human Brain Mapping in Vancouver, Canada. CoNECt @ Network Neuroscience 2017! Drs. Ajilore and Leow will be presenting NeuroCave and work from the lab at the Network Neuroscience Satellite meeting in Indianapolis. BiAffect named as the winner of the Mood Challenge for ResearchKit!!! We are very excited to announce that BiAffect has been named as the winner of the Mood Challenge for ResearchKit sponsored by the Robert Wood Johnson Foundation and Luminary Labs. For more information, check here.